Cool weather and muddy trails can be a runner’s heaven, but they require a bit more toughness from your socks. We’ve been testing the following styles, any of which are well suited for your autumn trail adventures. This model is a new entry in Wigwam’s Peak 2 Pub collection that is inspired by and named after classic trails, rivers and peaks. 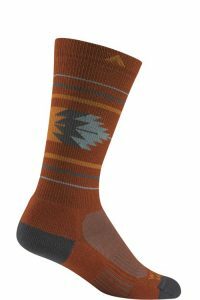 This fall, profits from all sales of Bears Ears socks go directly to the Utah Dine Bikeyah, a grassroots organization whose mission is to preserve and protect the ancestral Native American lands in the region we know as Bears Ears National Monument. 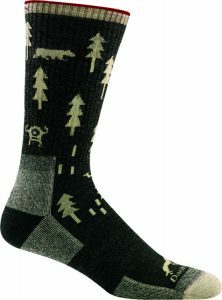 So you’re helping preserve outdoor lands, and you’re also getting a pretty nice sock. The Bears Ears crew uses Wigwam’s Ultimax moisture management system, which positions hydrophobic fibers in the foot and moisture transfer fibers higher up the instep and leg. This results in moisture continually being pulled from the inside of your shoe upwards where it can evaporate more easily. Other features include a lightweight cushioning on the entire underside, a breathable mesh instep, seamless toe closure, and a knit inside cuff to hold the collar in place. Point6 is a relatively new family owned business out of Steamboat Springs, Colorado. Many of their socks feature high merino wool content, as well as a dynamic nylon called 37.5, named for the optimal skin temperature (in Celsius) for managing exercise induced moisture. 37.5 fabric contains active natural particles that increase the surface area of the fiber, allowing it to use body heat to evaporate moisture in vapor form before it becomes sweat. These synthetic fibers end up magnifying the natural performance ability of wool, thereby improving body temperature regulation and humidity next to the skin. Point6 uses a compact spinning technique to build a sock that has minimal bulk but maintains the toughness of thicker products, and all of their socks come with a lifetime warranty. There are several 37.5 models to choose from, distinguished mainly by design, ankle height, and thickness. Hiking models tend to be a bit thicker than running models, but are perfectly suited for running, and provide a bit more insulation for chilly temperatures. The Mixed Stripe Light Crew has an ultra smooth toe seam, elastic support around the arch and ankles, and good structural integrity from foot to calf. CEP is always a favorite for those who like some compression with their socks; we chose the mid-cut height, but you can opt for anything from ankle height to full knee height depending on your preference. CEP socks provide dynamic compression of 15-20 mmHg in the foot and arch areas, which increases to 22 mmHg above the ankle. Many runners appreciate how the light compression stimulates blood flow to the foot and reduces swelling over the course of a long trail day. Another functional advantage is that the compressive fibers wrap the foot snug to create a second-skin like fit that stays secure even when wet or on irregular terrain. We especially like CEP’s models that incorporate merino wool, which decreases the synthetic feel of many compression garments, while improving the sock’s moisture wicking ability and odor resistance. The Outdoor Merino Mid-Cut can be worn for multiple days without stinking, and also without compromising its compressive ability. Other features include strategically placed padding on the ankle bones and over the first metatarsal head, an anatomic fit with distinct right and left sides, and seamless toe closure. This fall Smartwool has updated its trail running collection with the new PhD Pro Approach Light Elite , and they continue to deliver some of the sharpest design elements of all the socks we test. 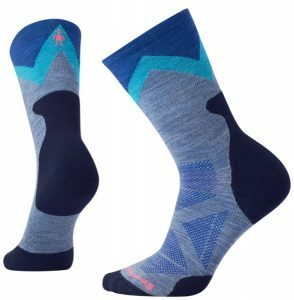 This is another model that is technically classified as a hiking sock, but is perfectly designed for trail running; the main distinction is a bit of extra cushioning in this hiking style compared to Smartwool’s thinner run-specific models. 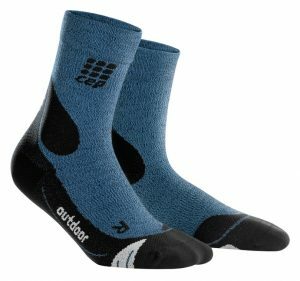 Although this is a new entry in the lineup, PhD Pro Approach socks utilize all of the construction elements that have made Smartwool so comfortable and dependable in the past. A 4 Degree Elite fit system uses two elastic bands for greater stretch and recovery while keeping the sock in place. Indestructawool technology increases durability in key impact areas, mesh ventilation zones provide breathability and moisture management, and a seamless toe box prevents friction up front. 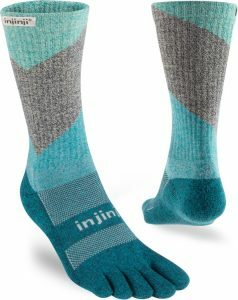 Injinji enjoys one of the most loyal followings among trail runners, and their Trail Series socks are designed specifically for uneven and unpredictable terrain. They are midweight socks with fairly even thickness all the way around, but with protective cushioning underneath and mesh ventilation on top of the foot. In addition to allowing natural foot splay, the separate toe compartments allow sweat to be pulled off each individual toe to keep your entire foot dry. Although the fabric on this model is midweight, we didn’t have any problems with the fabric between our toes feeling too thick. Injinji makes the Trail Midweight crew in two solid colors for those who like to be subtle, and in two cool pattern designs for those who prefer to be noticed. Our absolute favorite harsh-weather sock used to be a limited-edition model that only those “on the inside” at Darn Tough were able to enjoy. Thankfully, the ABC Boot Sock is now available to the public, and it is one of the most rugged and durable trail socks you’ll ever use. Curious about the name? It stands for Aliens, Bears and Camels, all of which are displayed on the sock, because… why not? The folks at this longstanding Vermont family business just like to get weird sometimes. There’s nothing quirky about the fabric construction, though, which is on par with all of Darn Tough’s performance models. Fine gauge knitting results in an exceptionally soft feel against the skin, fit is secure with no bunching, seams are virtually undetectable, and the high merino wool content is fast drying and highly breathable. As with a couple of others above, this is a crossover model between hiking and trail running, and the cushioning on the ABC is the highest in this roundup. The boot height and midweight thickness provide added insulation, as merino fibers preserve warmth even when wet. If your fall trail conditions are on the extreme end of the cold, wet, and sloppy spectrum, take some aliens, bears, and camels along to keep you comfortable. Cool sock lineup (no pun intended)! My personal favorite and also appropriate for Fall are a couple of socks from XOSKIN. The 5.0 Pro-Series Toe Sock and the 5.0 Graduated Compression Sock. Both socks are constructed with US Patented PTFE & Copper yarns, which the company refers to as RAPIDriCOPPER™. I’ve run 100 mile races with a single pair of the toe socks and no change. 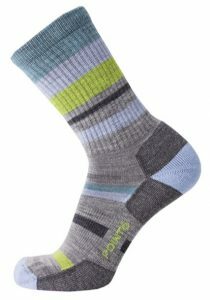 The secret is in the high-tech yarns, which when applied to a toe sock, give your feet maximum freedom and protection.